By Mariam F. Ayad. London and New York: Routledge, 2009. Hardcover, 216 pages, 51 b/w and color photos. I pulled this from the library shelves because I was interested in the subject of women in priestly or priestlike roles in ancient Egypt. 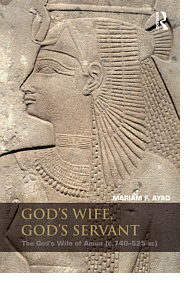 After a general historical overview of the title “God’s Wife of Amun,” the book focuses on five women from the Third Intermediate and Late Periods who held that position: Shepenwepet I, Amenirdis I, Shepenwepet II, Nitocris, and Ankhnesneferibre. For the most part, it concentrates on analyzing the iconography of depictions of the God’s Wives, and how they were shown in activities and contexts that had previously been the exclusive domain of the King — for instance, taking part in the sed festival, offering ma’at to the Gods, or being suckled by a Goddess. In exploring the evolution of the position and its associations with divine and royal authority, the book also refutes the view that the God’s Wife’s primary role was to sexually please the Gods. For me, the most interesting part of the book was the section describing the various rites and rituals celebrated by the God’s Wife. For example, a scene from the Edifice of Taharqo by the Sacred Lake shows the God’s Wife aiming a bow and the King hitting balls with his mace. The two of them, here depicted as equals, are performing a rite of protecting the tomb of Wesir from the enemies of the four directions. (The hieroglyphic caption by the God’s Wife reads: “The God’s Wife has grasped the bow against the South and the North, the West and the East in return for what he has given her.”) I think this could be translated into a extremely fun group ritual, by the way; it’s on my list of projects. Other rites include burning fans bearing images of Kemet’s enemies, elevating the Gods, and driving four calves. The text can get a little repetitive at times as the author describes the elements of the various represenations, many of which repeat from image to image: the costuming, the gestures, the relative positionings. Also, the proofreading is rather sketchy. (You know it’s bad when “Nitocris” is spelled three different ways — on the same page.) There’s a lot of intriguing info here, though, as well as photographs and line drawings of many obscure scenes, mostly from funerary and cultic chapels at Medinet Habu and Karnak. I don’t think it’s quite worth paying the book’s hardcover price (about $100US on Amazon at the time of this review) unless you have an extremely intense interest in the subject, but it’s definitely worth checking out of the library (or possibly getting on Kindle, where it’s only $28.76US). One of the things I’ve been meaning to do with this weblog is periodically post reviews, primarily of Kemetic-interest books and articles, although other things may also creep in occasionally. I’ve just posted my first review as a test run. FYI, these won’t all be current books — I thought it would be helpful for people to know about older, more obscure resources as well. Plus it’ll help me to keep track of what I’ve read. I hunted this down because I was looking for information about the relatively obscure gods Heryshef and Heru-hekenu. It does indeed include snippets of information about Them, along with other lesser-known aspects and syncretizations such as Heru-Khenty-Khety and Heru-Amun, in addition to the more prominent Herus, such as Heru-wer and Heru-sa-Aset. There are over a hundred little line drawings of Heru and other gods, and an exhaustive list of epithets of Heru, so there are plenty of interesting bits of knowledge in this book. On the down side, it’s rather dated — the author relies heavily on Budge, so be warned, and there’s a great deal of speculative history about the “people of Horus” coming to Egypt from somewhere in the Middle East, probably Arabia, which has been rejected by more contemporary studies. I honestly found it rather tedious whenever he began trying to trace a historical trajectory for anything, and there are three chapters of background before he really delves into Heru Himself. I was most interested in the chapters on Heru and the Names identified with or associated with Him; on the Eye of Heru; on representations of Heru; and the worship half of the chapter on theology and worship of Heru. (The theology part attempted to trace the development of Heru’s character through various stages, but given the author’s questionable history and the fact that he keeps conflating Heru-wer and Heru-sa-Aset in ways that I’m just not sure are accurate, I couldn’t bring myself to trust that portion of the chapter.) The chapter on places where Heru was worshipped got a bit listy, so I mostly skimmed it, but it’s certainly comprehensive. The book is out of print and as of now [June 2009] doesn’t seem to be available online. Used copies are very expensive, so your best bet is probably to check it out of your local university library, unless you’re a Heru devotee who’s trying to acquire all possible resources for your personal library. It’s a really good compilation of data from many older sources (including a lot that aren’t in English); just be sure to double check things, especially when the author starts straying into interpretation.